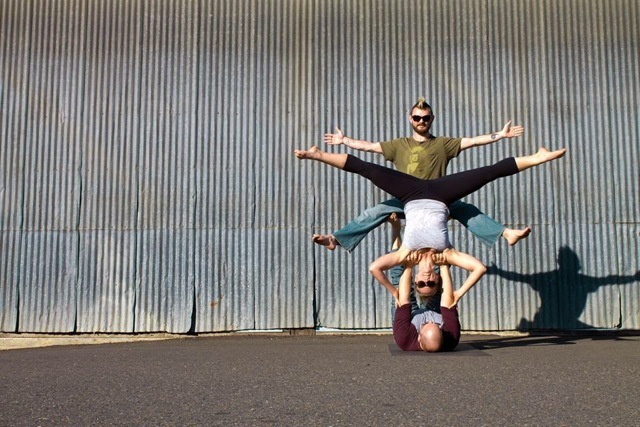 Learn the FUNdamentals of Acro Yoga - a blend of partner yoga, acrobatics, and thai massage. It's more accessible than you might think - with proper alignment and technique, you can learn how to do seemingly gravity-defying partner yoga poses. Step by step instruction from Reno Gorman of The Handstand Nation and Acro Revolution will help you safely get into poses you never dreamed you could do. This practice also allows for deep stretches and strength building poses, giving you a full body work out while you play! We end with cool down partner stretching and thai massage to leave you rested and energized. This is the most fun you'll have yogaing with friends! NO PARTNER NECESSARY - most people come to acroyoga classes without a partner. There will be plenty of people to pair up with, and we always play in groups of 3 anyways. Some yoga or similar movement practice is helpful. No acrobatic experience necessary!